If you regularly maintain your oven you can reduce the likelihood for repairs. There are a few things that you can do yourself to keep your oven working in top condition. If you are having problems and looking for Dobbs Ferry oven repair then look no further than the Appliance Doctor. We have experience with a range of makes and models and will ensure yours is working effectively. Here are three ways to help prevent the need for oven repair. Take the time to clean the inside of your oven. It may sound simple but it is often something that is overlooked until there is a buildup. If you keep on top of it, you reduce the need to use harsh chemicals. When dirt is left over time it causes staining and isn’t ideal for your appliance. If you are having any issues and looking for oven repair in Dobbs Ferry, contact the Appliance Doctor. Try and arrange to cook multiple dishes at the same time. This places less pressure on your oven as you aren’t having to reheat between each dish. You will also benefit by saving on your power bills. If you are cooking one dish at a particular temperature then need to make an adjustment for the next one, it requires less energy to increase if it is already in use. Cooking several meals at once saves on energy, running costs and is better for your appliance. If your oven is properly sealed it can work efficiently not letting any of the heat out when the door is closed. You can simply run your hand around the edges of the oven to see if there is any hot air coming out. If there is there could be a crack in the door gasket and must be replaced. Your appliance requires more energy to maintain temperatures if there is a problem with the door gasket. The Appliance Doctor supplies quality parts for Dobbs Ferry oven repair. With so many products on the market, you may be wondering which detergent you should use for your dishwasher. There are powders, tablets and liquid detergents that you can try for your machine. If your dishes aren’t cleaning properly you may need to get in touch with a dishwasher repair expert based in Dobbs Ferry or Westchester, NY. The Appliance Doctor can come to you all over Westchester County. Here’s how to determine which detergent is best for your dishwasher. If you are looking for an inexpensive solution you may opt for dishwasher powder. However, it’s usually not as effective as alternative methods. This is why you might not find many powders on the market. You may find the powder doesn’t completely dissolve or residue left on your load. It might be cheap but it is unlikely to get the job done. A more expensive option is the tablets. They contain the right amount for each cycle and some also contain rinse aid agent. These are the most popular as they are generally the most effective. They are easy to use as you just pop one in your machine and it’s ready to start. If you’ve tried several detergents and your load still isn’t cleaning you may need to seek dishwasher repair in Westchester, NY. Liquid detergent is less expensive than the tablets and will get your dishes clean. However, it is not as efficient as the tablets due to lack of precision measurement. You will find that it is a more effective cleaning agent than powder for your dishwasher. Try different products to see which detergent works best for your machine. Some makes and models typically work better with a particular type of cleaning agent. If you have tried a number of products and can’t get your load clean then it is time to find Dobbs Ferry dishwasher repair. The Appliance Doctor is the preferred choice of residents for dishwasher repair or any other appliance repair in Westchester or appliance repair in Dobbs Ferry. Your washing machine is typically one of your most used appliances. So you want to make sure it is in top working order to handle your laundry. If it’s no longer performing as it should, the Appliance Doctor is your go to for washing machine repair in Westchester, NY. Here’s how to maintain your washing machine. Even though water and detergent run through your washer, you still need to clean it. Washing powders and liquids leave a residue which can build up and cause odors in your machine and on your clothes. Every few months you should run an empty cycle set to the hottest temperature and add a cup of bleach to kill any mold spores. If you’re following our maintenance tips but still having problems then you may need to find washing machine repair in Westchester. Ensure you aren’t overloading your washing machine. Don’t try and fit as much as you can in there as your laundry won’t get clean and you are placing extra pressure on your appliance. Consult your instruction manual to find out how best to load your washer. Make sure your washing machine is on a level surface. If not it can cause extra wear and tear on your appliance and it won’t last as long. Use a liquid level and adjust the legs until it is level. For washing machine repair in Westchester, NY, contact our team at the Appliance Doctor. Check your hoses and fittings for damage. If there are any breakages it can result in leaks or if left there may be a flood. To make sure they are in top condition, it’s recommended they are replaced every five years regardless of damage. Maintaining your washing machine is important to keep it working efficiently and extend the longevity. For washing machine repair in Westchester contact the Appliance Doctor. You may think that by giving your dishes a rinse by hand before loading that you are ensuring, they are clean. However, recent studies have proven this isn’t the case. Save time and water by avoiding the pre-rinse and letting your dishwasher do its job. For repairing dishwasher issues, contact the Appliance Doctor for expert appliance repairs in White Plains. Here’s why you shouldn’t rinse your dishes before putting them in the dishwasher. If you have bought your appliance in the last few years, you shouldn’t need to pre-rinse. The technology has evolved so that your dishwasher assess how clean your dishwasher and runs a cycle accordingly. If you have already rinsed your dishes, then it assumes they are fairly clean and doesn’t provide a thorough cycle. This can leave harmful bacteria remaining on your load. If you leave them dirty, your machine will provide a deep clean. To ensure your dishwasher is working properly, contact the Appliance Doctor for service all across Westchester County. Older machines may require you to rinse if food is heavily cakedon. If you’re not convinced that you don’t need to pre-rinse, don’t take our word for it. Read your manual as it will let you know exactly how to use your dishwasher. Usually, you will be advised to place the dirtiest pots to face the center of your washer. A high-quality detergent, the high temperatures and the angles of the water jets are designed to leave your dishes squeaky clean. Skipping out the pre-rinse is better for the environment as well as your bills. Many dishwashers are energy efficient and save water. However, running the tap to rinse your dishes beforehand counteracts this saving. It also wastes unnecessary time which is better spent elsewhere. Let your appliance take care of your dirty dishes instead. If you find your dishwasher is no longer cleaning effectively, contact the Appliance Doctor to repair appliance in White Plains, NY. If you use your oven most days, you will notice it requires regular cleaning. Over time it can be difficult to clean, so it’s important that you maintain it. If your oven stops working for any reason, contact the Appliance Doctor if you’re in Eastchester. We can have your oven working again in no time. 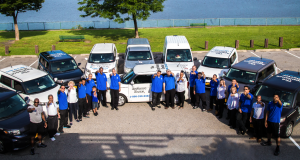 Our team can come to you all over Eastchester, NY. Here are five ways to help keep your oven clean. Ensure you have a drip pan or tray in the oven to catch anything that spills over. Aluminum foil can also be placed on the bottom shelf to make sure it doesn’t go all over the oven. By taking precautions to prevent splatters, it will be easier to keep on top of cleaning your appliance. Similarly, you should also cover what you are cooking. If your dish has a lid, you can use this. It not only promotes even heating of its contents but only reduces the mess it makes. Foil can also be used if you don’t have a lid for your dish. While foil is useful for catching spills and in place of a cover, you should never line the base of your oven with it. When placed too close to the heating element, aluminum foil can set alight. Preventing your oven from getting dirty is an excellent idea as long as it’s not a fire hazard. It may seem simple, but it can make life easier if you make sure you clean as you go. After every use, you can wipe up spills so that it’s ready for your next meal. It’s important to wait until the appliance has cooled down first so as not to burn yourself. For ovens that require a deep clean, place of a bowl of water on the middle shelf for 15 minutes. This steams the inside which makes it easier to wipe away the mess. If you have any issues with your oven in Eastchester, call the Appliance Doctor for any appliance repairs in Eastchester straightaway.